Part D deals with management control and risk and it covers 15% of the syllabus. You have the possibility to practice more than 500 questions per each paper (that includes all the questions from the study mode and 60 questions from the Mock exam with unique questions). If you want to get used to the real exam structure, atmosphere and time pressure, you can practice as many Mock exams (or mini Mocks) as you wish as the questions from there are randomly taken from the P2 syllabus. Each exam will be different, but if you covered the study mode, you might recall some questions. That's why you can check your knowledge and your preparation status for the exam by completing a Mock exam with unique questions. There is no repetition there and you can check your progress by looking at your detailed score. 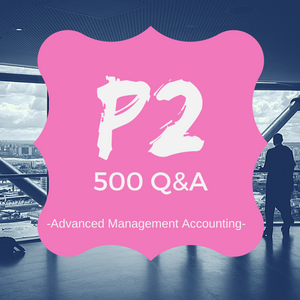 Try our free demo with questions covering different levels, including the P2 paper.